The last summer weekend is past. I hope it was good for you and your health. The weather was fine so it was no reason to stay at home with warm blanket, hot tea and favorite book. More than that it's like crime when blue sky and sun are outside. I enjoy the sun! It doesn't burn but pleasantly coddles by its rays. And the air is cool, pleasantly cool. Nevertheless the autumn comes. 2. Remove leaves from thyme and rosemary sprigs. Discard stem, and chop the leaves. 3. Cut tomatoes in two. 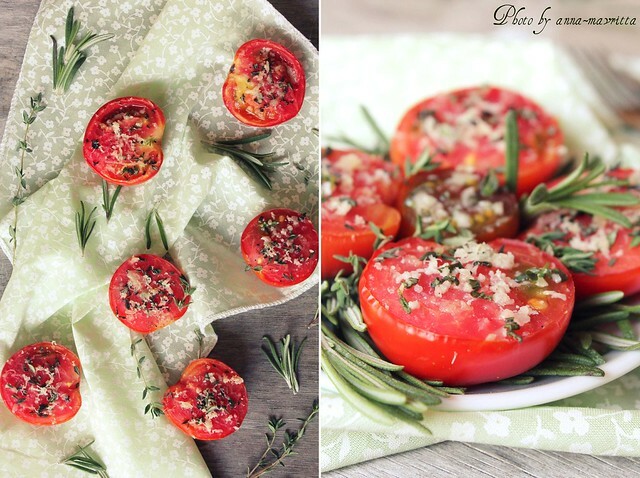 Place the tomato halves in a baking dish. Sprinkle generously with salt and black pepper. 4. 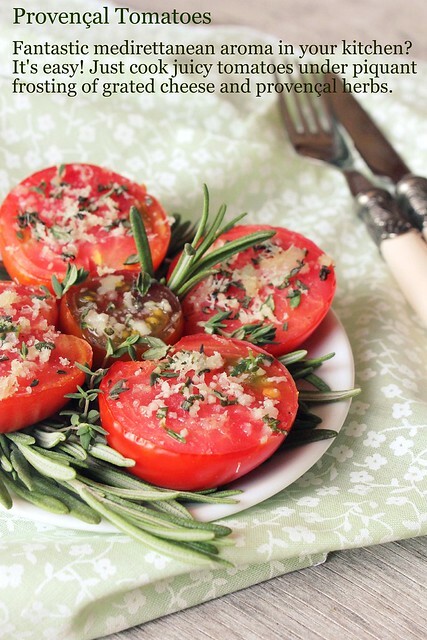 Place minced garlic and chopped herbs on the tomato halves. Sprinkle the grated Parmesan over and bake for 15 minutes or until they are tender. 5. Whisk together olive oil, salt and pepper. 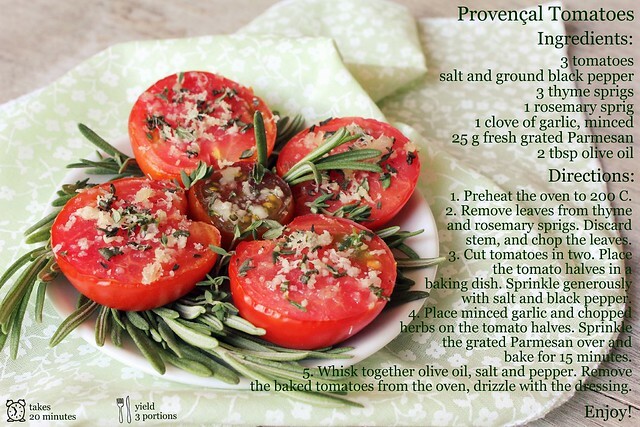 Remove the baked tomatoes from the oven, drizzle with the dressing. Последний уикенд лета позади. Надеюсь, вы провели его с пользой для здоровья и души. Погода порадовала, поэтому сидеть дома в обнимку с теплым одеялом, согревающим чаем и любимой книгой не пришлось. Да что там: это равно преступлению, когда за окном голубое небо и солнце. Люблю солнце! Оно уже не жарит, а ласково нежит своими лучами. И воздух прохладный, приятно-прохладный. Всё-таки приходящая осень дает о себе знать. Да. 1. Разогреть духовку до 200 С. 2. Измельчить листья тимьяна и розмарина. 3. Разрезать томаты пополам, переложить в форму для запекания, посолить, поперчить. 4. Посыпать томаты чесноком, травами и сыром и запекать 15 минут. 5. Смешать оливковое масло, соль и перец. Перед подачей сбрызнуть запеченные томаты заправкой. Hi! I'm anna-mavritta and I'm keen on cooking. To my great surprise and my family's gladness I realized that spending time at the cooker is very fascinating especially if it's connected with baking and sweets. I enjoy experimenting with unusual combinations and getting new flavours. Welcome to my blog! Today I'd like to show you the apple: not fresh, not baked, but boiled. Are you interested? Welcome!